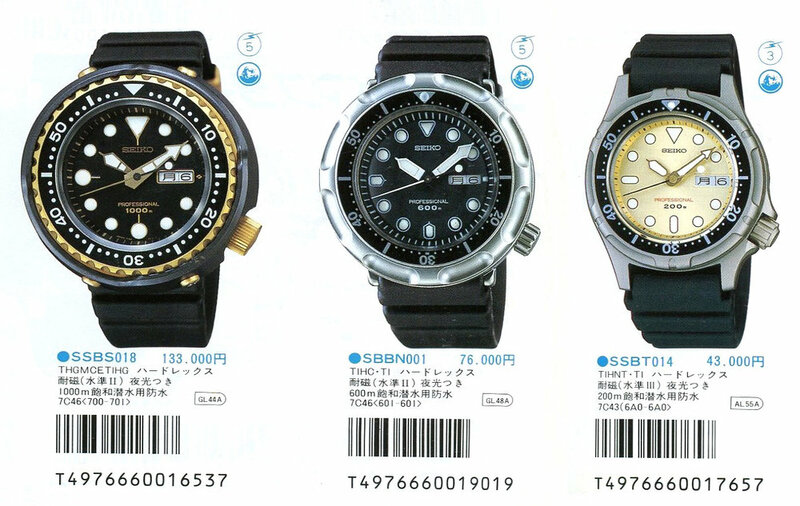 Seiko has used many different materials for watch cases over the years. These greatly expanded in the late 70's and 80's when a range of different case materials were tested and various materials were employed to utilize their specific properties. The different materials used in the watch case construction are detailed in product catalogs and are often indicated on the case itself. This listing was initially created from the 1991 Seiko JDM dealer catalog but additional items have been added. The abbreviation is the case material that is listed in the catalogs and the case back stamping is what is often but not always marked on the watch case back. Here is an example of the case material codes from the 1991 Vol. 1 Catalog, e.g. SBBS018 has the case material code of THGMCETIHG, the SBBN001 has a code of TIHC.TI and the SSBT014 has TIHNT.TI. See below for a table listing the various case material codes that have been used used. Note **: Although it is hard to scratch it is slightly brittle so care should be taken to avoid shocks such as a drop.